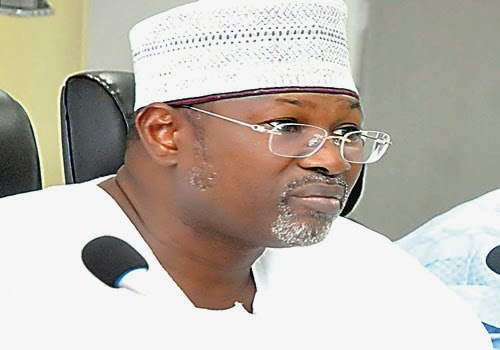 THE plot to ease out the chairman of the Independent National Electoral Commission (INEC), Professor Attahiru Jega, from office before the March 28 general elections thickened on Friday as the Federal Government hinted that civil service rules would determine his exit, according to tribune. While the Federal Government disclosed this, the Northern Elders Forum (NEF), also on Friday, warned President Goodluck Jonathan against removing Jega before the presidential election. The Federal Government said that the exit of Professor Jega as INEC chairman would be determined by the existing laws guiding the Federal Civil Service. Under civil service rules, an officer is bound to proceed on terminal (pre-retirement) leave three months to the end of his service. Jega’s tenure ends on June 30, 2015. The Supervising Minister of Information, Edem Duke, who made the clarification to journalists, however, said that the INEC boss would not be sacked as being insinuated in some quarters. The All Progressives Congress (APC) caucus in the Senate had, on Thursday, raised the alarm that there was a plot by the presidency and the Peoples Democratic Party (PDP) to compel Jega to proceed on terminal leave next week. Denying the report, Duke anchored his position on the recent assurance given by President Jonathan during the last presidential media chat. Duke maintained that it was natural for anybody who reaches the terminal date in service to ease out, adding that everything is now “within the terrain of the president and he has spoken. “The issue of the INEC chairman, I want to align myself with Mr President on that. “This is not to say that if it is time for the INEC chairman to ease out of office, the natural civil service law would not be allowed to take its course,” he said. “It is like saying a civil servant has done 35 years or attained the age of 60, we now begin to say that he must not retire or he must retire. I think all of that is in the terrain of the presidency and he has spoken. I have not much more to add to that. “I will also like to say once on that issue. I recall that for several weeks now, people have kept threatening the president on the shift in the date of the poll. You begin to wonder that parties have a couple of extra weeks in order to reinvigorate their campaigns and try to reach as many voters as possible. Rather than do that, you begin to identify imaginary pockets of unlikely developments and then focus your attention on them and then when you lose election, you begin to complain,” Duke added. Members of the APC in the Senate had alleged that there was a fresh plot by the Federal Government to prevent Jega from superintending over the forthcoming general elections. The APC senators, led by George Akume, told a news conference in Abuja that they heard from a reliable source that the Head of Service would direct Jega to proceed on his pre-retirement leave next week. “We have received information from a very credible source that next week, the Chairman of INEC will be given a letter from the office of the Head of the Civil Service to proceed on a terminal leave,” they said. The opposition senators alleged that the Federal Government was trying to use a circular from the HoS, dated August 11, 2010 to place Jega on compulsory pre-retirement leave. The lawmakers explained that the circular, with reference number HCSF/CMO/1772/TI/11, talks about clarifications on pre-retirement leave, which is only applicable to tenured officers who are career civil servants. They said anyone who has spent 30 years in service or has attained 60 years of age was bound to disengage officially from the service. The senators, however, said that the case of Jega did not fall into any of these. The lawmakers claimed that Jega’s offence was his readiness to conduct the elections when the PDP-controlled Federal Government was not. The opposition senators insisted that using the issue of card readers to discredit Jega would not work because the National Assembly appropriated money for that purpose. Meanwhile, NEF has warned the presidency against any attempt to remove Jega from office before the general elections. This is just as the forum emphasised that elections must hold within the timeline allowed by the law and new administrations at the federal and state levels must be ushered in on May 29 based on credible, free, fair and transparent elections. Addressing a press conference, on Friday, in Bauchi, Bauchi State, the spokesman of the forum, Professor Ango Abdullahi, in company with a one-time Minister of Special Duties, Alhaji Mohammed Bello Kirfi, warned that sacking Jega at this time would be a recipe for disaster. He said such an action would indicate that President Goodluck Jonathan’s administration was determined to rig the elections. “With regard to Jega’s tenure, any attempt at this last minute by this government or its agency to remove Jega is a clear message that this government is determined to rig an election in which they see Jega as an impediment simply because he thinks that the commission must follow the rules for a free and fair and credible election. This is the message they should be ready to send to the world,” the former vice chancellor of the Ahmadu Bello University (ABU), Zaria, said. While lamenting that the February 14 elections were postponed for “flimsy, clumsy and indefensible” reasons, Abdullahi declared that the electoral body had for several months now been consistent and emphatic on its readiness to organise and conduct the elections in February. “The explanations so far given by the authorities concerned, including Professor Jega, are curious, suspicious and unconvincing to discerning minds within and outside the country. Not a few believe that the real reason for the postponement is for the ruling party and vested elite interest to buy more time to see if they could avert what appears to be a looming defeat at the polls,” he stated. Professor Abdullahi added: “Assuming that the soldiers are needed, we need to know that of the about 180,000 soldiers in uniform, only about 20,000 are presently in the North-East of the country. He added that Jega had admitted a few lapses in the distribution of the Permanent Voter Cards (PVCs) but also assured that certainly, these were not sufficient to lead to postponement of elections. The NEF chief, therefore, raised the alarm that it was apparent that there existed various sinister scenarios being hatched by the ruling elite to scuttle the general elections and derail regular democratic institutions from functioning to serve the needs of Nigeria and its people. He submitted that among the scenarios were the use of soldiers to rig the recent election in Ekiti; massive use of public funds to bribe voters and personnel officiating elections; intimidation and harassment of opposition as ample evidence seen in various parts of the country, including Rivers, Kano and Lagos states and refusal to accept modernisation of the balloting process by the sitting government. The former vice chancellor stated that the insistence of the government on the use of old methods for elections was a means for it to rig as in previous elections, adding that evidence of this was a suit allegedly filed by the Attorney-General of the Federation to stop INEC from using PVCs and card readers. Professor Abdullahi, therefore, declared that NEF rejected any arraignment, which was outside and which was inconsistent with the 1999 Constitution of the Federal Republic of Nigeria as amended.